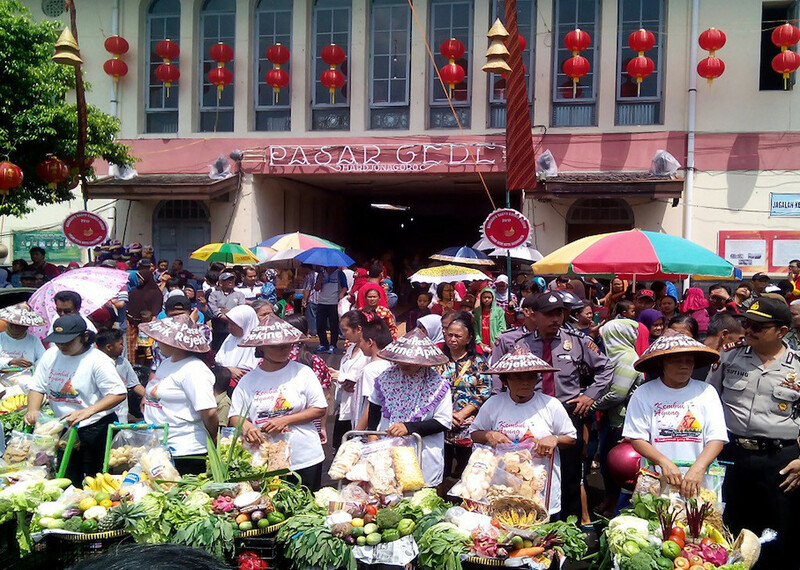 Market vendors of Chinese and Javanese ethnicity hold an event at Pasar Legi Market in Surakarta to celebrate Chinese New Year. Ethnic Chinese and Javanese live in harmony in Chinatown's Sudiroprajan subdistrict in Surakarta, Central Java. Annisa Lee has slightly dark skin and has curly hair that reaches to her shoulders. She and two other young women have just moved a relatively big statue from the altar to the bathing place in the Tien Kok Sie temple in Surakarta, Central Java. She pants a little and sweat beads her forehead. She wipes away the sweat to prevent it from running into her eyes. At a glance, one can easily see that she is different from the other women in the temple, especially her dark skin and curly hair, although they all have similar eye shapes. “My father is Chinese; Mom is indigenous Javanese. You can call me Chinese or Javanese, whatever. One thing for sure is that I am an Indonesian,” the girl said. She said her father, Harry Liem, met her mother, Sri Sukesi, when both were university students. Sukesi’s family initially disapproved of Sukesi's relationship with Liem because he was of Chinese descent. But they found Liem to be a kind man, and he was very polite and serious about building a relationship with Sukesi. And so her family finally gave the nod to their relationship. Two years after finishing their studies, Liem and Sukesi got married in 1997. Annisa was born a year later. Liem ran an architecture consultant office, while Sukesi took care of the finances. Now, after more than 20 years of marriage, Liem runs a property business. Annisa said her family did not consider mixed marriages odd. “We have two religions in the house, but our religious and social life is normal, not just in the family but also in the community,” said Annisa, an engineering student at a university in Bandung, West Java. She said it was those who still thought being ethnic Chinese or Javanese made a difference, and therefore a problem, who were odd. Cultural acculturation, including in Surakarta, she said, was a necessity. The community comprised people of many backgrounds -- Chinese, Arabian, Indian, Madurese and others. She said she was used to people calling her ampyang (peanut brittle), a term used to refer to a child born of an ethnic Chinese-Javanese marriage. “For me it’s normal. Just call me ampyang, no problem,” said Annisa. Bayu Herlambang shared a similar story. His father, Bambang Suseno, is a Javanese man from Sukoharjo, Central Java. His mother, Santina Tan, is a Chinese-Indonesian from Semarang, Central Java. Bayu said having two different religions in a house made the family members very tolerant. “In my family, Idul Fitri, Christmas and Imlek all are equally joyful,” said Bayu. During Ramadan, he said, his mother cooks for his father to break the fast. On Saturday and Sunday, his father takes his mother to church. “It has been like that for over 30 years. We're a happy family,” said Bayu, who runs an advertising company in Jakarta. Annisa and Bayu are just a few among those who were born of a mixed marriage. In Surakarta, marriages between Chinese-Indonesians and Javanese people are called ampyang marriage. Martono Hadinoto, who is a local figure of Chinese descent, said the word ampyang referred to a snack made of brown sugar and groundnut. The sugar in ampyang is considered a symbol of Javanese ethnicity while the groundnut symbolizes Chinese ethnicity. “Ampyang is sweet. That is actually the essence of plurality. Differences are normal,” Martono said. He said an ampyang marriage united not just two people but also two cultures. 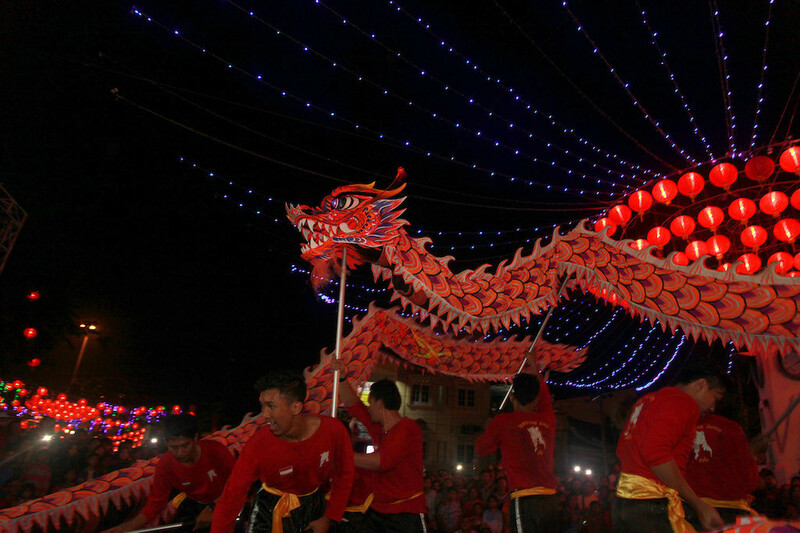 It is a real example of acculturation and assimilation between Chinese and Javanese cultures. 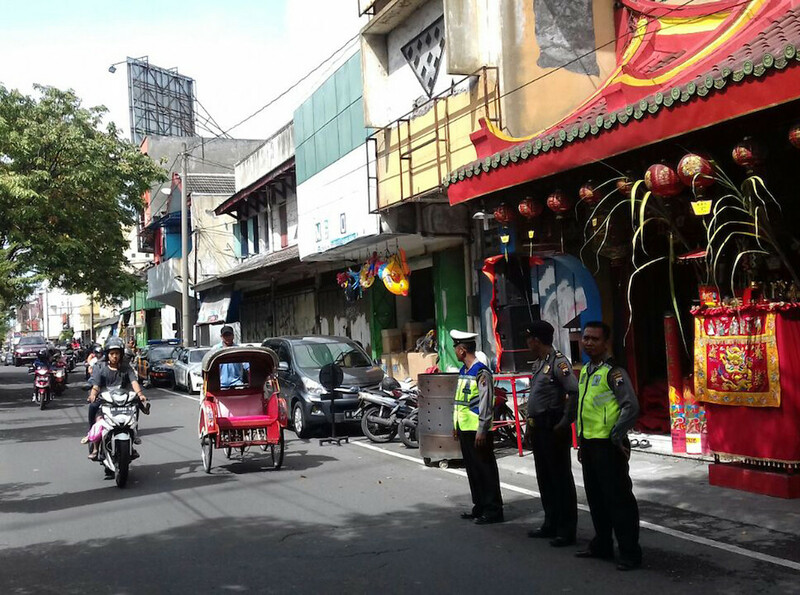 In Surakarta, the harmonious relationship between the Javanese and ethnic Chinese can also be found on a bigger scale in society, such as in Sudiroprajan, a Chinatown subdistrict. “Sudiroprajan is a miniature example of the meeting of two cultures, Javanese and Chinese,” Martono said. Historian Heri Priyatmoko said the ethnic Chinese community had lived in Surakarta since the city was first established in 1746. They have lived in Sudiroprajan from the beginning and maintain harmonious relations with native Surakartans and other newcomers, including ethnic Arabs in Pasar Kliwon. During the reign of Surakarta sultan Pakubuwono X (1893-1939), ethnic Chinese were relocated to Balong village, behind Pasar Gede Market, to enliven trade in the area. “[The relocation] marked the beginning of ethnic and cultural assimilation that occurs naturally between Javanese and ethnic Chinese in Balong,” Heri said. He explained that this was done in the early 1900s. This later became the standpoint for acculturation in other Chinatown areas in Sudiroprajan, such as in Kepanjen, Ketandan, Limolasan and Mijen. In Sudiroprajan, religious tolerance and assimilation between Javanese and ethnic Chinese is considered the norm. Differences in ethnicity, culture and religion do not prevent people from interacting with each another. Many inter-ethnic marriages have occurred over generations as a result, and they raise families that are multiethnic, multicultural and of different religions. Most people in Balong, Mijen, Limolasan, Kepanjen and other villages in Sudiroprajan are familiar with ampyang marriages. “It's normal. It's been common for a long time,” said Sudiroprajan subdistrict head Dalima. There have been 15 racial Javanese-Chinese conflicts in Surakarta recorded throughout history. The biggest two occurred in 1980 and 1998.